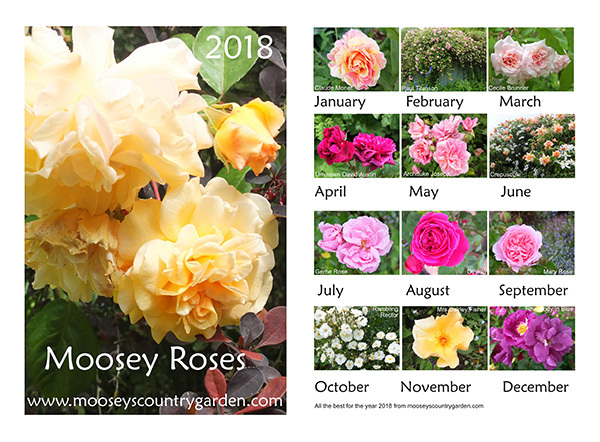 Here is my 2018 Moosey Garden calendar. But this year I've chosen pictures of my favourite flowers - roses. It's free for you to download, print off, and enjoy. The names of the roses are on the back cover. You'll meet Claude Monet early in the year, and 2018 will end in a Rhapsody in Blue. The Rambling Rector charges through October, while the more well behaved David Austin roses occupy several other months. Adobe Acrobat Reader is required to view PDF files. This is a free program available from the Adobe Web Site. Follow the download directions on the Adobe web site to get your copy of Adobe Acrobat Reader. And check the printing options for PDF files - for example, you can just print off one page at a time, or fit two pages on one sheet of paper.